The family of a homeless man killed by Los Angeles police on Skid Row sued the city and police department August 5, contesting officers' claim that the man reached for one of their guns and calling it "a classic case of abuse of power and deadly force." The lawsuit filed by the family of Charly Keunang, a native of Cameroon, seeks $20 million, and also names police Chief Charlie Beck and the three officers who fired the six bullets that hit Keunang, including two to the chest. It claims wrongful death and negligence. The 43-year-old Keunang's March 1 death was captured on video by a bystander and has been viewed millions of times online. The killing prompted protests and drew comparisons with the death of black men in other officer-involved shootings across the U.S.
Attorney Joshua Piovia-Scott, who represents Keunang's parents and sister in the lawsuit, said the legal action seeks "justice for Charly and his family and the rest of the victims of this epidemic of police killings." "No one should have to endure the pain of watching a loved one unnecessarily and unlawfully killed by the LAPD on a video posted on Facebook," Piovia-Scott said, adding that he believes Keunang's race played a central role in his death. He said the officers involved in the shooting, including one who is black, showed a shocking disregard for human life. "We have six heavily armed, trained police officers and one unarmed homeless man who was trying to retreat, trying to defuse the situation, and in a matter of moments, they're holding him down to the concrete pavement, shooting him in the chest and killing him," Piovia-Scott said. The officers then handcuffed Keunang without trying to render any medical aid "and looked on while he bled to death in pain and terror," the lawsuit said. Officer Norma Eisenman, a spokeswoman for the police department, declined to comment on the lawsuit or make Beck available for an interview Wednesday. Beck has previously said the shooting was justified because Keunang grabbed for a rookie police officer's gun after ignoring commands and becoming combative. Beck said the officer's gun was later found partly cocked and jammed with one round of ammunition in the chamber and another in the ejection port, indicating a struggle for the weapon. An autopsy showed Keunang had meth and marijuana in his system when he died. Piovia-Scott said if police have nothing to hide, they should release footage from body cameras worn by the officers, which the department has declined to do. Police have said Keunang was a robbery suspect. However, the lawsuit said another homeless man had called 911 on Keunang over an argument. The police department's inspector general and the county district attorney are investigating the shooting. Keunang came to Los Angeles to follow his dream of becoming a Hollywood actor, Piovia-Scott said. 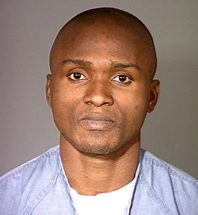 He served 13 years in prison after being convicted of robbing a bank and pistol-whipping an employee in 2000 in an effort to pay for acting classes at the Beverly Hills Playhouse. While in the federal prison in Minnesota, Keunang was assigned to the mental health unit, and federal officials said medical staff determined he was suffering from a mental disease or defect that required treatment in a psychiatric hospital, documents show. Piovia-Scott said Keunang's family disputes that he was mentally ill.
Keunang found his sister, who lives in Boston, on Facebook soon after his release and took a bus in June back East, where he was reunited with his family. His family said he was planning to get off the streets. "Nothing can justify the way he was killed," Keunang's sister, Line Foming, said Wednesday. "Now when I see the police, I don't feel safe. That is why I seek justice for Charly. So no one ever has to feel this way again." Her husband, Charles Foming, said the bystander's video of his brother-in-law's death "doesn't look like a mistake." "It looks like an execution," he said.